It’s out. At least, I think it is. One of the things you don’t know about books until you write one is that it’s not entirely clear when, or indeed whether, they’ve actually been published. 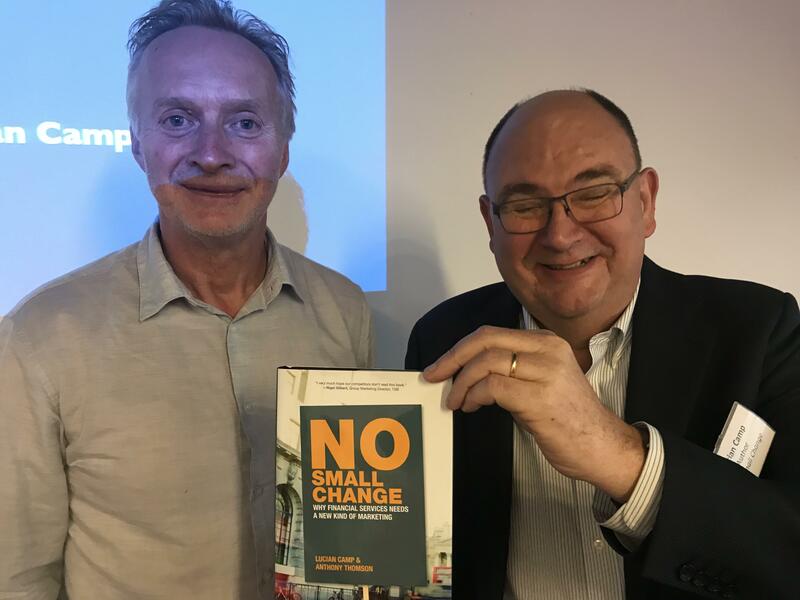 According to Amazon, No Small Change – my book about financial services marketing, co-written with my old friend Anthony Thomson. – isn’t published until June 22nd. In fact, though, unless I dreamed it, we held two very jolly launch events on Tuesday and Wednesday this week (5th and 6th) and sold a stack of copies at each, and if that’s not “being published” I don’t know what is. And in fact I can’t have dreamed it, because, as you can see, there is photographic evidence. And I look so uncharacteristically delighted that I must be holding a real copy of the book and not just some kind of dummy which has to stand in for the real thing until the publication date. Thomson’s expression is, it must be said, a bit more equivocal. But then again, he must be balancing uncomfortably on stilts to be towering above me to that extent. Encouraged by the almost Kardashian-like number of views of my last blog, discussing research on how FS marketers define marketing, I thought I’d try another research-based topic. 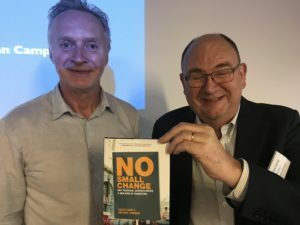 And like last time, the research content is a brief summary of findings from a study among senior financial services marketing people, commissioned for my forthcoming book No Small Change, co-written with Anthony Thomson and published early next month. Just to reality-check responses to that first question, we also asked respondents whether they believed that strong end-consumer brands are generally important for success in financial services. 95% said they were, and no-one said they were not at all important. You have to say, on behalf of the financial services marketing community, that these findings are a bit of a worry. Here is a business asset which is generally accepted to fall within the remit of marketers, and agreed by between 93% and 95% of respondents to be important for success – but where somewhere around 50% of respondents believe that their own firm’s brands are weak, and/or that competitors are stronger, and/or that their firms don’t actually possess the degree of differentiation that provides a platform for brand-building. I don’t think that in this blog I have much to add to that last paragraph (unlike in the book, where as I recall we bang on about it at some length). The only thing I do have to say is that of course, at a purely personal level, the picture painted by these findings makes me wonderfully, blissfully happy. It looks like there’ll be loads of work for financial services brand consultants like me for many years to come. My mother’s garden suffers from something called Honey Fungus. This is a vicious and deadly fungus which lurks indestructibly under the ground – and bursts out, quite unpredictably, every now and then, to destroy some innocent and innocuous plant, shrub or tree. There’s nothing to be done. No matter how carefully my mother has tended the plant, shrub or tree, the honey fungus can kill it in a matter of days. In this analogy, obviously, the plant, shrub or tree is a carefully-nurtured brand; my mother is the marketing team responsible for the careful nurturing; and the honey fungus is an IT meltdown like the one TSB is currently suffering. Like all analogies, it breaks down if you push it too far. I think honey fungus is always fatal, but TSB will live to fight another day. But it wouldn’t work half as well if the fungus wasn’t deadly. It would be unkind to make too much of this, but Sod’s Law is currently afflicting TSB with a vengeance. It was only about three months ago that the bank pugnaciously announced a year of intense challenge to the lazy and complacent “Big Five” High Street Banks – a challenge kicked off with a punchy new animated TV commercial depicting the Big Five as sleeping fat cats and TSB as a lively little squirrel running rings around them. “Break free and go somewhere better,” the voice-over exhorted us. Three months on, the fear now is that it’ll be TSB customers infuriated by their inability to access their accounts after a disastrous IT upgrade who’ll be doing the breaking free. And “somewhere better” could mean almost anywhere. As I say, churlish to make too much of this, and important to remember it could happen to anyone (and indeed has happened to several of those fat-cat competitors in the past). But I think it is worth briefly pondering the implications of this kind of melt-down for marketers generally, and especially for those responsible for brand management. Ad industry trade paper Campaign reported on January 22nd that “Five years after its re-establishment by competition authorities, TSB is planning to underline its challenger brand status with a year-long marketing drive encouraging consumers to end [their current] banking relationships.” I suspect this “year-long marketing drive” may now have returned to its garage. The book (No Small Change, co-written with my old friend Anthony Thomson) continues to inch its way towards publication (on May 31st), but this last week has seen unusually eventful inching. It would be churlish to comment in any way other than positively on the role of our delightful publishing team at Wiley, so I’ll politely suggest that the reason no-one there had actually read it until a week or two ago was their complete confidence in its excellence. However, when someone there did eventually read it, I hope they found it excellent but I know they found it a bit troubling from a legal point of view, with particular regard to a) quite a large number of possible libels, and b) a rather smaller number of possible breaches of copyright. At the 57th minute of the 11th hour Roger the lawyer was given the manuscript to read, and at the 58th minute he came back with eleven pages of closely-typed areas of concern. At the 59th minute I sat down to work through them all, and owing to the lack of available minutes there wasn’t much opportunity for negotiation, just an opportunity for JFDI. A couple of good bits did have to go. But I’m here to reassure you that there are still quite a few good bits left. And if you buy a copy, I can share some of the deletions on a one-to-one basis. Honestly, who wrote this rubbish? Ah, I think perhaps I did. I’m about half-way through correcting the proofs of my forthcoming financial services marketing book No Small Change, co-written with my old friend Anthony Thomson. For an inveterate copy-tweaker like me it’s a challenging exercise, because we’re under strict instructions not to change anything unless it’s obviously and embarrassingly wrong – a typo, for example, or an incorrect fact, claim or number. I haven’t actually read large chunks of the book since I finished writing it late last summer, and I have to say I have almost no memory of much of it. For example, I’ve just read a paragraph slagging off moneysupermarket.com’s website, which I don’t recall ever visiting, and I’m amazed by the apparent strength of my feelings on the subject. Coming back to all this material with a largely fresh perspective, I find myself frequently unsure whether to leave it as it is or make changes to it. I don’t really think I have anything much against moneysupermarket,com’s website, and anyway I’m sure they’ve changed it all since the iteration I was writing about. I know a couple of people there, and I have no desire to fall out with them. And the criticism I’m making – about a lack of integration with the brand’s TV advertising – applies to dozens of financial services firms: why should moneysupermarket.com be singled out for such a kicking? On the other hand, my brief is clear: don’t make changes unless what’s written is obviously and embarrassingly wrong. It’s neither, and also it’s actually quite funny. Unfair maybe, but I think I’ll leave it as it is.